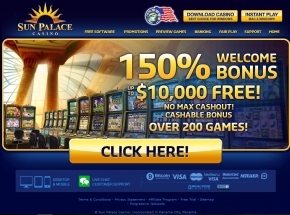 Sun Palace Casino has been around since 2002 and is still going strong. This Online Casino is operated by Mainstreet Vegas Group out of Costa Rica which is known to be a reliable gambling group operator. This casino offers several slot machines, table games and pretty much gives you the normal games that you would find in a casino.